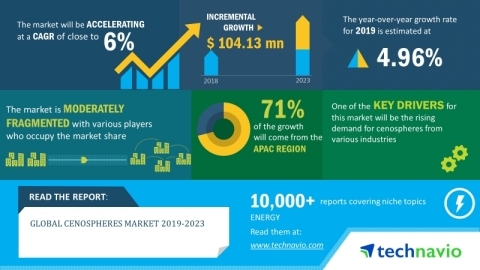 The global cenospheres market is expected to post a CAGR of close to 6% during the period 2019-2023, according to the latest market research report by Technavio. Cenospheres have applications in various industries including construction, automotive, pharmaceuticals, and oil and gas. Cenospheres are used as fillers in various automotive applications such as clutch facings, tires, friction linings, dashboard, and brake linings. In the oil and gas sector, they are used as filler lubricants in oil drilling activities under high stress and heat conditions. In the pharmaceutical industry, cenospheres, when coated with drugs, can be injected into a patient's bloodstream to treat an infected area and heal wounds faster. Cenospheres also have painting and coating applications as they provide additional qualities such as controlling of infrared radiations when used in coatings. Therefore, the growth of these end-user industries will propel the demand for cenospheres during the forecast period. As per Technavio, the technological developments in the coating industry will have a positive impact on the market and contribute to its growth significantly over the forecast period. This global cenospheres market 2019-2023research report also analyzes other important trends and market drivers that will affect market growth over 2019-2023. The coating industry has been witnessing significant technological advancements in paints and coatings. These technological developments have led to the emergence of coatings and paints with superior benefits such as the killing of pathogens that harm the coated surfaces and reducing of odor. The industry offers several types of coatings and paintings such as microbicidal, antibacterial, and antimicrobial. Vendors in the coating industry are also developing products with low volatile organic compounds (VOCs) or no VOC formulations. Low-VOC coatings with new resin technologies, including water-based acrylic coatings, are widely being used globally. As cenospheres are used as fillers in paints and coatings, the growth in the coatings and paints market will increase the consumption of cenospheres. “The rise in urbanization has resulted in the development of both commercial and industrial (C&I) sectors which is driving various industries such as construction, automotive and pharmaceutical. These industries widely use cenospheres for several applications, leading to market growth,” says a senior research analyst at Technavio. This market research report segments the global cenospheres market by type (gray cenospheres, and white cenospheres) and geographic regions (APAC, EMEA, and the Americas). The gray cenospheres segment held the largest cenospheres market share in 2018. The growth of this segment is driven by the higher natural occurrence of gray cenospheres as compared to white cenospheres. The numerous applications of gray cenospheres will contribute to their high demand in the market. The APAC region led the market in 2018, followed by EMEA, and the Americas respectively. The market growth in APAC can be attributed to the increasing use of cenospheres for various applications in different industries, and the high production and consumption of coal in the region. More From BioPortfolio on "Global Cenospheres Market 2019-2023 | Technological Developments in Coating Industry to Boost Demand | Technavio"